What is & How do I Use Live Message on Note8? 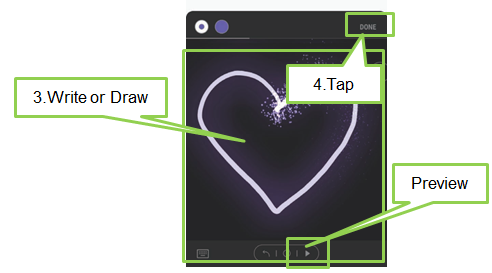 • Allows users to create and share an animated handwriting GIF image that contains their own handwriting and self-made Emoji. 1. 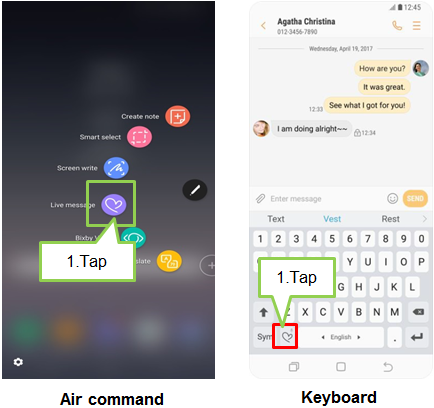 When you want to send an animated message while composing a message, open the Air command panel and tap Live message. Alternatively, tap icon on the Samsung keyboard. The live message window will appear. • BACKGROUND : Change the background image. You can also select an image from Gallery. Note : When you reach the maximum capacity that can be saved as a live message, you cannot write or draw more strokes. 4. When you are finished, tap DONE and send the message. 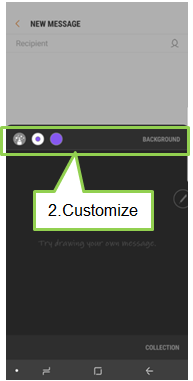 The live message will be saved in Gallery as an animated GIF file and it will be attached to the current message. To create a GIF after writing a Live message, it takes some time to convert a message to a GIF file; depending on the number of strokes, it may take a minimum of three seconds up to a maximum of 15 seconds. ※ IM lists supporting Live Message may differ by region and country. Major IMs supporting the GIF Animation feature: WhatsApp, Facebook Messenger, WeChat, QQ Mobile, Kakao Talk, Line, etc.